I was wondering if anyone would be interested in a Roadfood One-Day Crawl in Evanston, my home for 47 of the past 51 years, sometime during the summer. If so, there are numerous restaurants that would be great to go to, although I'm not sure if they would all be considered Roadfood and regionally appropriate, or even worthy of the group's attention. I also don't know how we would contend with space issues in the restaurants if a lot of the group wanted to attend. We could do an 11-4 or so, like June 2nd, or start earlier and end later, whatever seems like a good idea. DB3 Donuts. This would need to be an early stop, because I think they run out during their limited weekend hours. Patisserie Coralie, for some of the best pastries around. Taco Diablo. Owned by the same person as Lulu's, and sharing the building, I love their tacos and their guacamole. Lulu's. Their sesame noodles are really good. Their menu is smaller than it was before they moved, but they still have lots. Edzo's, for my favorite smashdown, griddled burgers. Sometimes I find the bun a bit heavy, which is the only drawback. And their fries are fantastic. Evanston Chicken Shack. On the Eater 2017 list of the 20 best fried chicken places in the Chicago area. Giordano's or Lou Malnati's. Obviously, branches of some of the most famous pizza in Chicago. Anywhere there wasn't enough seating we could go to my house. I would have plenty of room outside if it's a nice day, or inside if it isn't. On the way out of town you could stop off at Poochie's, or even Mustard's Last Stand. And, we could end at the Graeter’s in Winnetka. It’s about 10 minutes from my house. Let me know what you think. Crazy? Not worth the trouble? Am I insane? Burgers and chicken always get my attention. Be very, very careful about making this offer. You've met most of this group...do you really want them to know where you live? Plus, at the end of the day you'd have to check every cabinet and cubbyhole to make sure ChiBears15 isn't hiding somewhere. OMG, you’re right, I hadn’t thought of that! Never mind. My big concern is that it seems that I’ve also volunteerd to organize everything. I guess let’s see how many seem to be interested and then try to pick a date. We're in if the day is right! I wonder if it will be possible to set it up for a Sunday in late July or early August. I don't assume many people would want to do it on a weekday, and I work pretty much every Saturday through August 11th. I also work on two Sundays in July. I leave on August 15th for the Carolinas and Savannah for 8 days. I would be interested but have a fair bit of travel going on this summer. I should be able to attend if I'm in the Chiwaukee area and free on the chosen date. Pick a date. Assuming I don't have a work conflict, we're in. The only thing I'd question is the stop at Le Peep. Evanston has to have a breakfast option that isn't a national chain. I'd suggest Sarkis, but they've been getting spotty reviews since the new owners took over. Golden Olympic Restaurant gets a fair amount of love on the internet. Ovo Frito Cafe seems to be a winner with some south of the border breakfast interpretations. Peckish Pig has possibilities if you can wait until they open for brunch at 11am. Jennifer's Edibles has some good Soul Food options at VERY reasonable prices. Sher Main Grill gets high marks from fans as an "authentic diner". The rest of the day looks great! The only thing I'd question is the stop at Le Peep. Evanston has to have a breakfast option that isn't a national chain. I didn’t even realize it was a chain. I haven’t actually been in probably two decades. Bat17 might be a possibility. I’ve never had breakfast there, but the menu looks pretty interesting. I am worried about long lines. Hoosier Mama might be the best choice for breakfast. And then again later for pie!! Edited post #9 to include some breakfast suggestions. Another option, if you're willing to break free of Evanston's gravitational pull, would be Walker Bros. Original Pancake House up Green Bay Rd. in Wilmette. Possibly add in Bill's Hot Dogs if we're still hungry? chicagostyledog says skip their Hot Dogs and go for the Burgers. I think its a great idea! I have only been to Evanston once, and always wanted to explore their food offerings! I would love catching up with you in Savannah. Since I was modeling this after last week's event, starting at 11 am, I hadn't thought too much about an actual breakfast spot, throwing in La Peep because I saw it mentioned in an Eater article. There's also The Lucky Platter on Main Street, which I used to go to fairly regularly. Walker Brothers is great, and I don't mind going outside of Evanston (and I was going to suggest the Graeter's in Winnetka to finish it off), but it would probably need to be a very early first stop, especially on a Sunday, and might make the day too long. I've seen lines of over two hours long. I doubt if you would want to start the day at 7 am! Bill's would certainly be a good Roadfood stop. I also used to go to the Fish Keg a lot, but haven't been in decades now. I wouldn't mind that as well, but it's going to be hard to fit everything in! That would be great. On Sunday (August 19th) I was considering making the drive to Southern Soul, hoping to get there at around 11 when they open. I don't know what would be good for you. I'll probably go to AJ's Dockside for lunch on Saturday, and I have an actual reservation for Vic's on the River for Sunday at 7:30, definitely followed by Leopold's. I'll be getting to Savannah on Friday, after stopping at Jackie Hite's from Columbia. I had planned on Gerald's Pig and Shrimp on Tybee Island for dinner that night. Let me know what you think. I'm certainly flexible if you have some suggestions. I would be interested in Evanston when dates become available. It's a perfect venue and distance for me as I no longer have a co-pilot and Jashim is traveling this summer. How does Sunday, July 29th sound? That's during the time billyboy is in town. Maybe he'll join us. That would be great. I’d like to meet him. Sunday, August 5th also works for me, if there were plans for something in Chicago with Billyboy. Maybe somebody could contact him and find out his thoughts. And it would be great if anyone interested in this madness would chime in with their preferred date. I suggest we go lite on breakfast (no sit down meal) to avoid dampening of the enjoyment of later food stops. Perhaps a good bagel if there is a place in Evanston that makes them. Or has Firecakes opened there yet? As far as the date goes, just pick a couple days (not too many) that will work for you and float 'em for the group. The best date will get settled fairly quickly. As we've all learned in the past, due to various conflicts and commitments, not everyone can attend every tour. We all accept that fact and there are no hurt feelings. Don't overload the schedule. Maybe plan an early (optional) breakfast (or two) for those who are interested. The rest will join in when they can. Again, this is one of the limitations of Roadfooding; no hurt feelings for anyone who can't or won't participate in the entire itinerary. Thanks Jim and Jeff for your suggestions. Jim, I think you're right about no sit down meal for breakfast. The only really good bagels in the area are at New York Bagel and Bialy on Dempster Street in Skokie. It might be good to stop and pick up a few on the way into Evanston. Jeff, of course you're right about picking the date, and not overloading the schedule. I'll do my best! The dates that will work for me are July 29th, August 5th and August 12th. Everyone interested please make your preference known. I would like to make the official start at 10:00 at Hoosier Mama. I really like her biscuits, and I've been told that her biscuit sandwiches are great. And, of course, her pies are fantastic. I don't know how long a wait it will be, but I don't imagine it will be any longer than Bang Bang was last week. This is her list of pies you can order, and in the past she has told me that with a few days notice she'll make whatever pie I want. Of course, this isn't a complete list, because it does change depending on what is available. I'll try to find out after we pick the date. So if you have one that you would like her to make, I'll talk to her about it. For those who are interested in starting earlier, I propose, and I'll be at, DB3 donuts at 8:00 and Patisserie Coralie at 9:00. And maybe New York Bagel at 7:30. I'll mull over the other places, but I would like an idea if ending with deep dish pizza is a good idea, and if so, which you prefer between Lou Malnati's and Giordano's. It's also been suggested that we try Union Squared for Detroit style pizza*. I haven't had it, but I've heard good things about it. I think they have a very small space, so it might be difficult, depending on the size of the group. I'll go over sometime and check. If pizza doesn't seem to be a good idea, we'll make an adjustment. Oh, and I definitely think that a stop at Graeter's in Winnetka after the pizza would be a great way to end. * Just a note: I tried Union Squared tonight and I thought it was okay, but I'm going to eliminate it from contention. 29th and 12th would work for me. All three dates work for me, David. All three are good here. Just a note; I need to turn in a work availability schedule for July by the 15th of this month. So in order to make sure I'm not scheduled to work on the July 29th date, we need to make the final pick by a week from Friday. I’m hoping to hear from a few more people soon and make the decision by Wednesday at the latest. Since I haven't been to the Evanston Chicken Shack in many years, I thought I should give it a try to see if it is a worthy stop for "Evanston Day". Here are a few pictures. 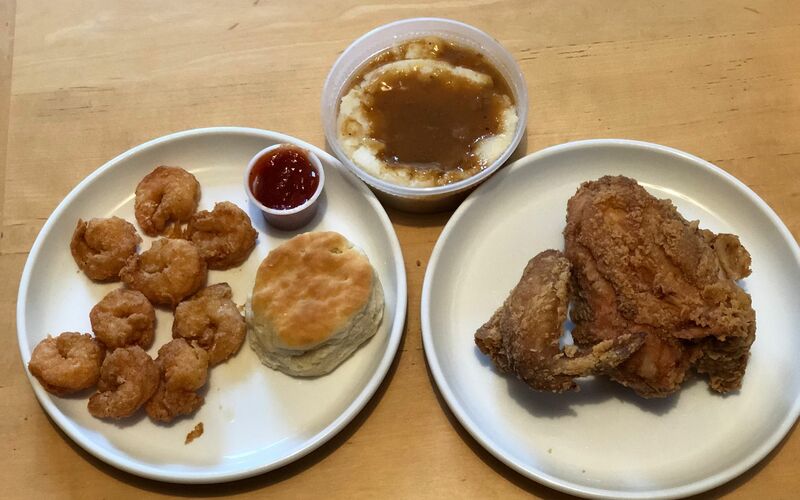 I ordered a two piece white meat snack, with a biscuit and mashed potatoes, plus a 1/4 pound of fried shrimp. I had never had their shrimp before, but after the Redhot Ranch, I wanted to see how they compare. 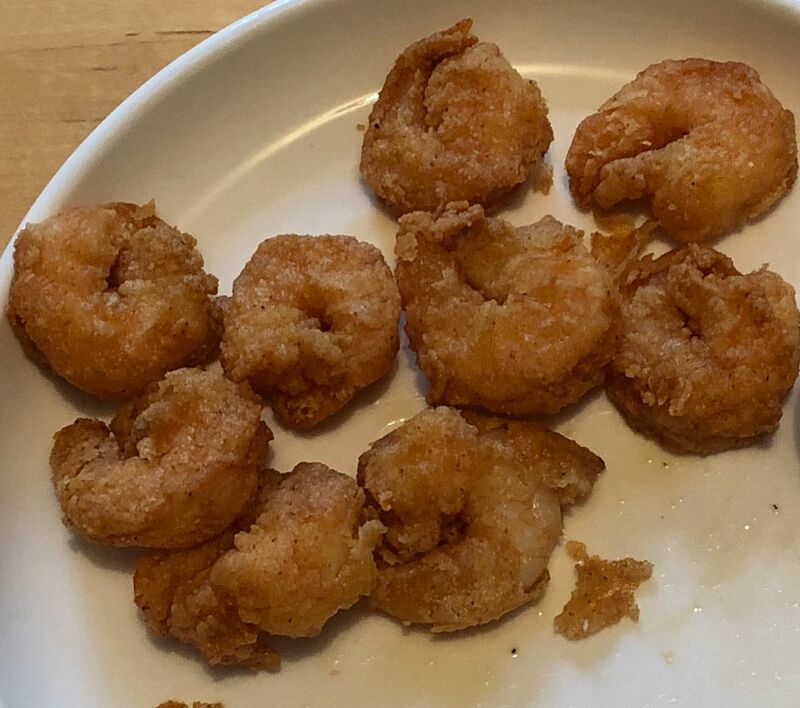 The shrimp were on the small side, although I think they have larger ones as well, although maybe not. I thought they were pretty good, not as good as Redhot Ranch, but still worthwhile. The cocktail sauce was good as well. The biscuit was a bit of a weak point, although I think if it had been warmer it would have been better. The chicken had very good flavor, and I enjoyed it quite a bit. 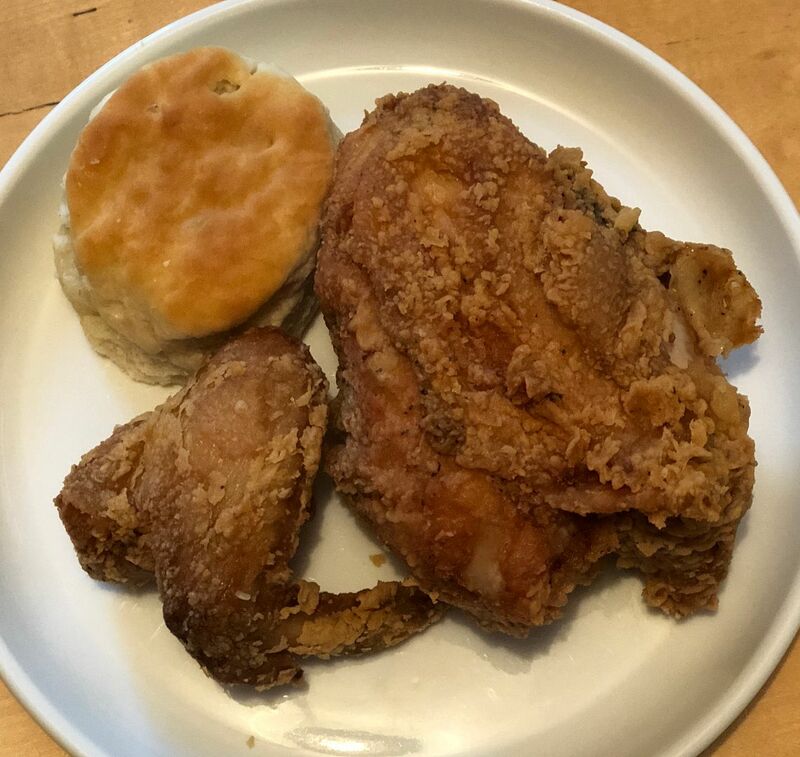 It's not the best fried chicken I've ever had (I still give that distinction to a good day at Grady's in Dudley, NC) but certainly worthy of a stop on the tour. 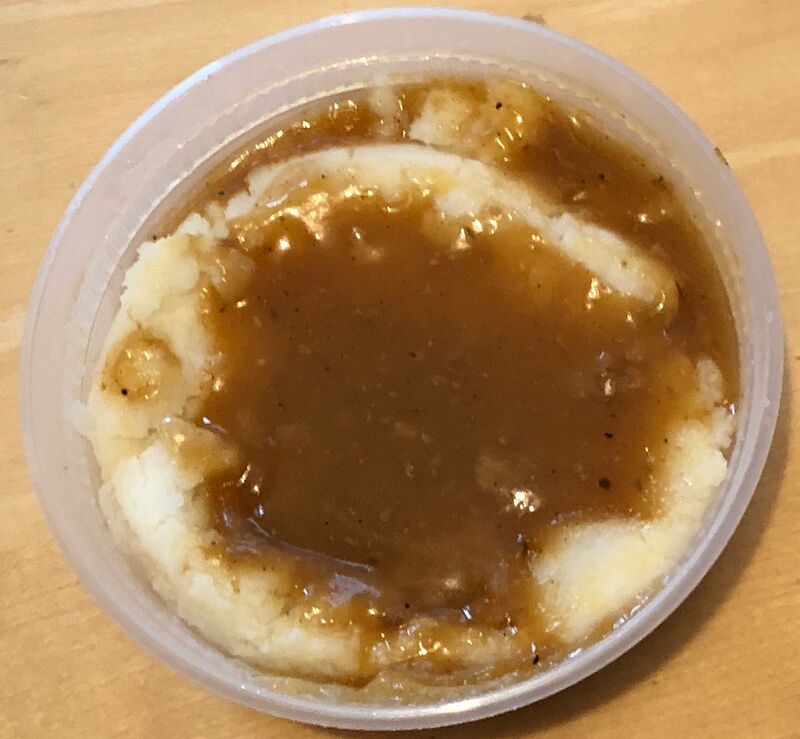 The mashed potatoes were good, I'm sure helped by the tasty gravy. I think this will be a good stop. However, there are only three small tables in the crowded space, and I think it would be much better to come to my house for this stop. I normally don't have drinks or anything like that at my house, since I drink almost nothing but Starbucks iced tea. I could stock up with a few things, if anybody wants me to. They do have cans of pop at the restaurant. I've heard from a few more people about which Sunday it will be. Anyone else? Dining al trunko is also an option. But if you insist on bringing a dozen or more rowdy Contingencies into your home, who am I to stop you?